On these maps of Indonesia, you can see many of the places noted in Pramoedya’s Quartet. 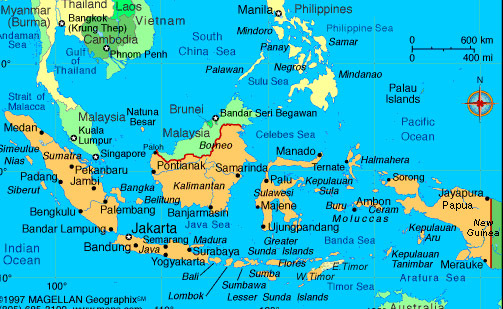 On the island of Java, there are Surabaya and Jakarta. (Jakarta, the capital of Indonesia, is the modern name for Batavia, or as Pram called it Betawi). To the far northwest, one finds the city of Banda Aceh, capital of Aceh. During the time of the Quartet, the Acehnese waged a long hard war of resistance against the Dutch, who were determined to take over the region. Bali lies to the east of Java, at the beginning of the twentieth century, the Dutch occupied the north of the island, but the central and southern areas remained independent kingdoms. The Dutch successfully invaded the kingdoms in the first decade of the twentieth century. The town of Menado is located on the northern tip of the island of Celebes, just across from the Philippines to the north. Pangemanann, the main character of the fourth book, is Menadonese. Lastly, to the immediate west of the island of Ambon lies the island of Buru, used as a prisoners’ colony by the Indonesian government in the 1970’s. Pramoedya spent ten years there as a political prisoner. Dutch East Indies / Nederlands-Indië Index is a list of links to websites dealing with the Dutch East Indies,including photos and maps. Indonesia WWW Virtual Library is not as useful as it used to be.